Dr. Doug MacGilpin is thrilled to join Midcoast Orthodontics and carry on the tradition of providing exceptional orthodontics and patient care! He is known by patients, families, and colleagues as talented, experienced, professional…and fun! Dr. MacGilpin graduated with honors from Meharry Medical and Dental College, in Nashville, then completed his Orthodontic Residency and received a Master’s Degree from St. Louis University. He has been practicing as an Orthodontist for the past 9 years in Connecticut and Massachusetts. Dr. MacGilpin has been exposed to multiple modalities of Orthodontic therapy and has extensive experience with Invisalign. Dr. MacGilpin has received many academic awards and has been published in the journal The Angle Orthodontist. 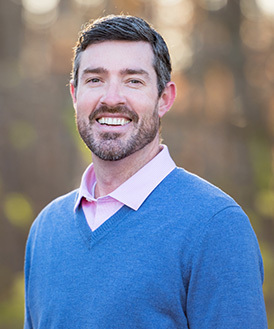 Dr. MacGilpin was born and raised in West Hartford, Connecticut and has lived many places before landing here in Maine, including Ireland, Nashville, St. Louis, and Boston. He and his wife, Kate, live in Yarmouth with their two children, daughter Harper, 6, and son Tucker, 3, and their beloved rescue dog, Tivoli. Outside of the office, Dr. MacGilpin most enjoys spending his time with family and friends. He enjoys playing golf, hiking, skiing, traveling, and wearing funny socks. Dr. MacGilpin is always eager to talk with you, answer questions and will do everything he can to make your orthodontic treatment experience as easy and enjoyable as possible!